What a delight I have for you today! I reached out to Theresa of Montessori in Real Life to ask if I could interview her for the blog and she said “yes”. 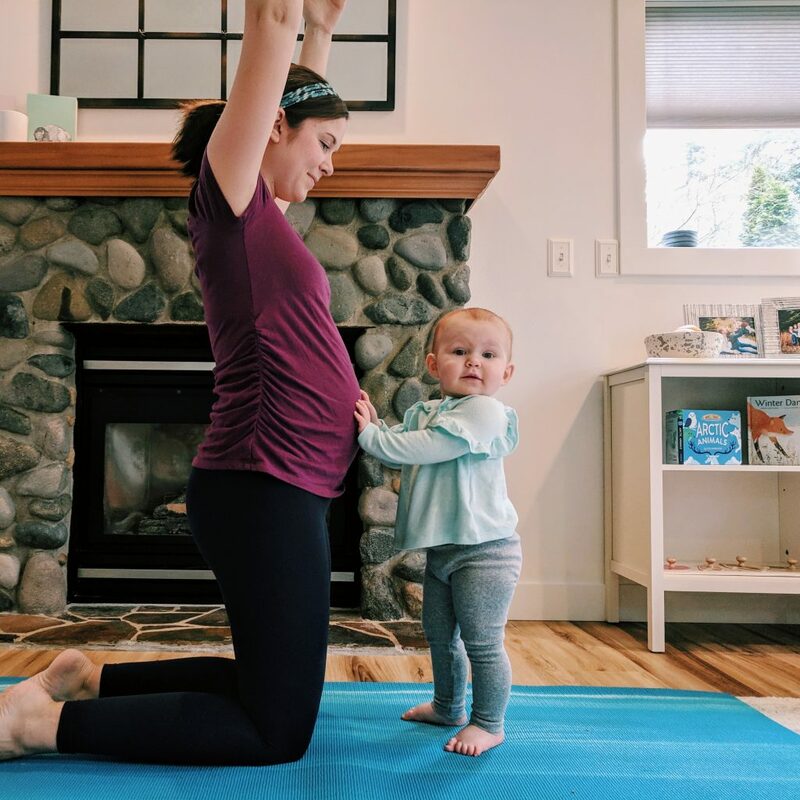 For those that haven’t yet discovered Theresa, she was a Montessori toddler teacher and now full time mama to the lovely Dakota (and expecting their second child very soon). I love following her on Instagram where she shares snippets of their home life and the simplicity, calm and focus are truly inspiring. So today we get to learn more about what it’s like to be a Montessori teacher applying the Montessori principles at home with your own child. I love how Theresa speaks of their daily walks, where they have no timeline, simply time for Dakota to splash in puddles and explore. I am sure you will be inspired. 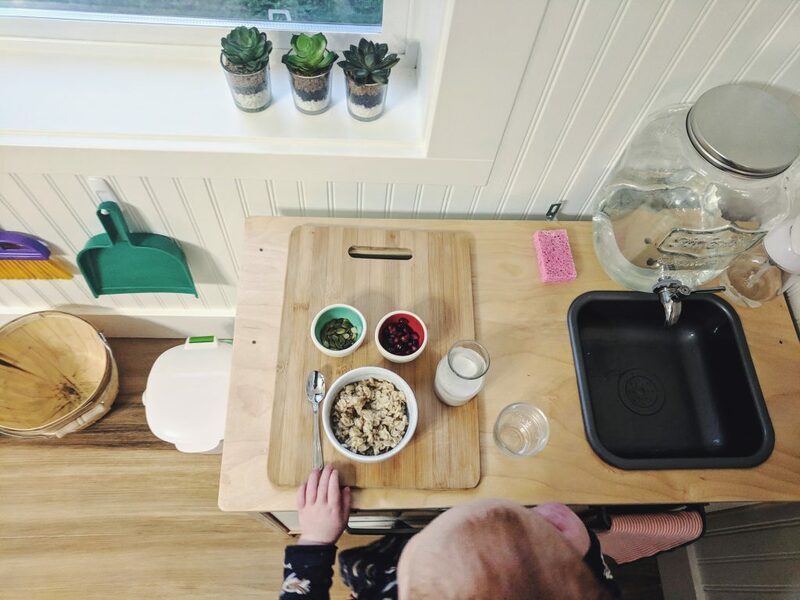 Plus you will definitely want to check out this post about how they’ve adapted the IKEA kitchen to transform it from a play kitchen into a functional kitchen for Dakota. 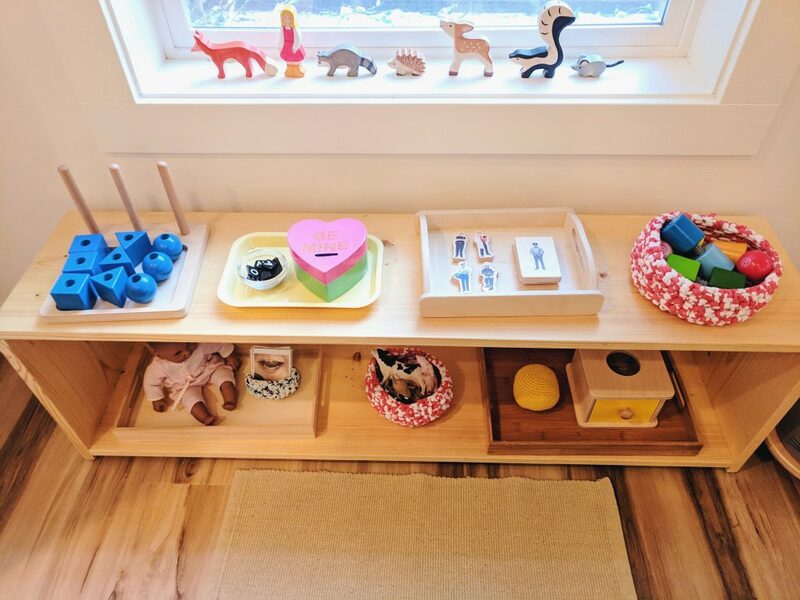 Thank you so much Theresa for letting us take a peek into your home and learning more about raising toddlers in a Montessori way. 1. Who lives in your home and where are you located? 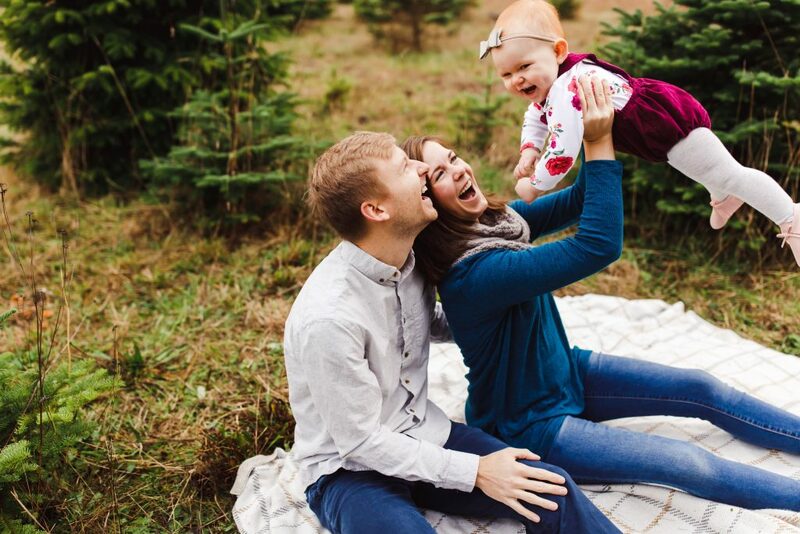 My husband and I live in Seattle, Washington with our 19-month-old daughter, Dakota, and our vizlsa. We will welcome a new family member, a baby boy, at the end of May! 2. Before having Dakota, I understand you were an AMS toddler teacher. 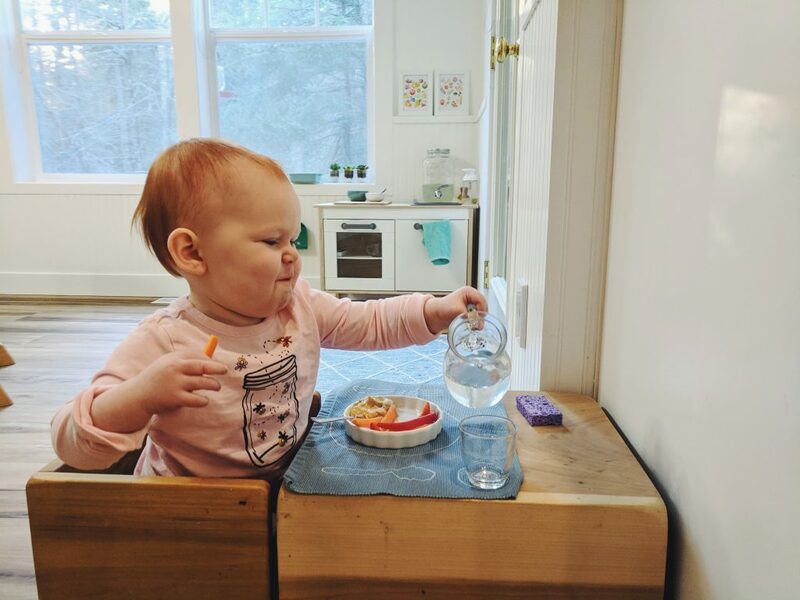 How do you find applying the Montessori principles at home with your own child versus when you were in the classroom before kids? Since becoming a parent, I have realized that it is much easier to stick with routines in a classroom, when there is more structure and a formal schedule. At home, there is flexibility in our schedule and we go on short outings most days, so our routine changes a bit too. I would also say that the role of “mama” versus “guide” has come with a lot more self-doubt, emotion, and compassion for other parents! Though my confidence in Montessori education hasn’t wavered, I empathize with parents’ challenges in implementing every principle at home. 3. What is currently your favourite thing to do at home with Dakota? Currently, reading. We read so many books! We have started going to the library together to keep up with her passion, and it has been fun for both of us to expand beyond board books to larger picture books. 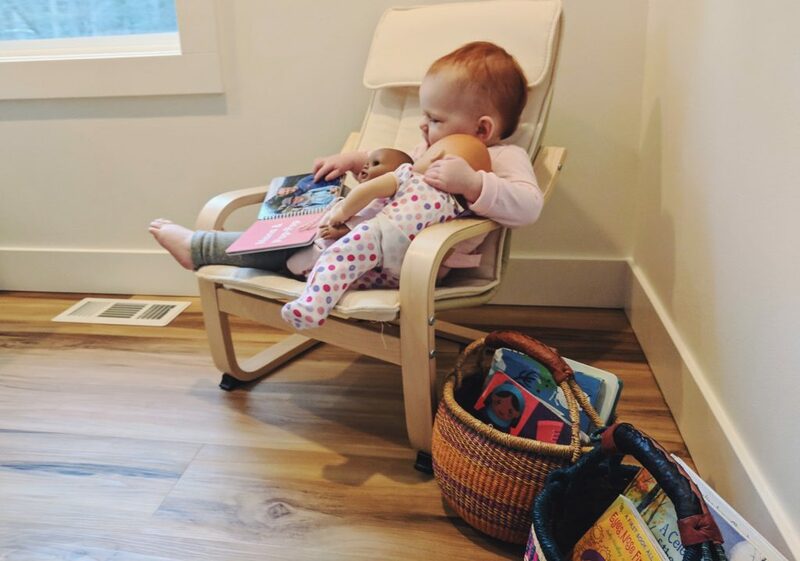 At least a few times a day, we curl up together on the couch and read a couple of books (she usually has a favorite of the day or week that we just read on repeat). 4. 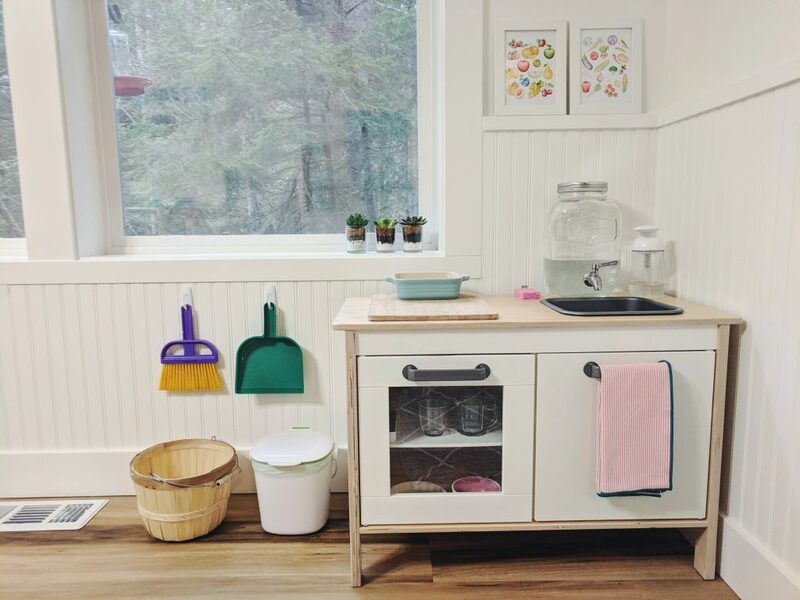 How do you set up your home to help apply Montessori at home? And your cosiest spot in your home? 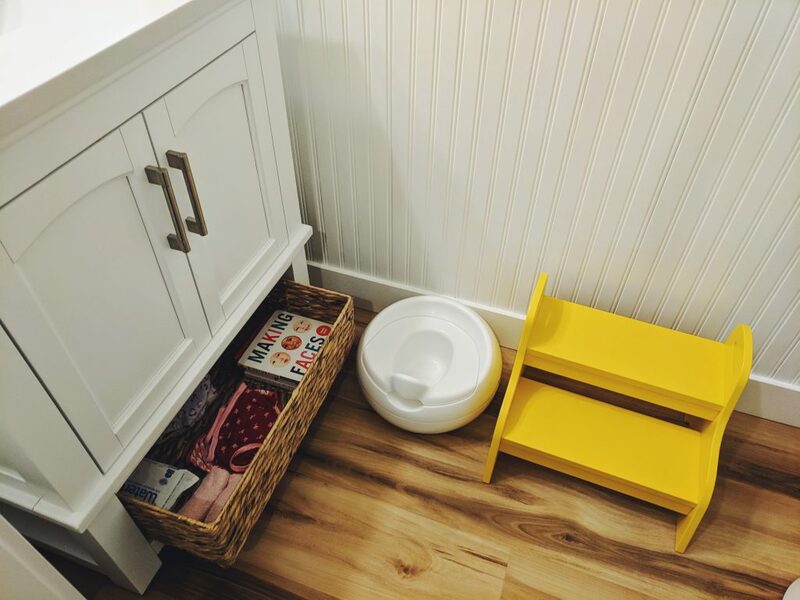 I try to make as much of our house toddler-friendly and toddler-accessible as possible. Instead of having a designated playroom, Dakota’s furniture and materials are embedded in our living areas, where we spend our time together. 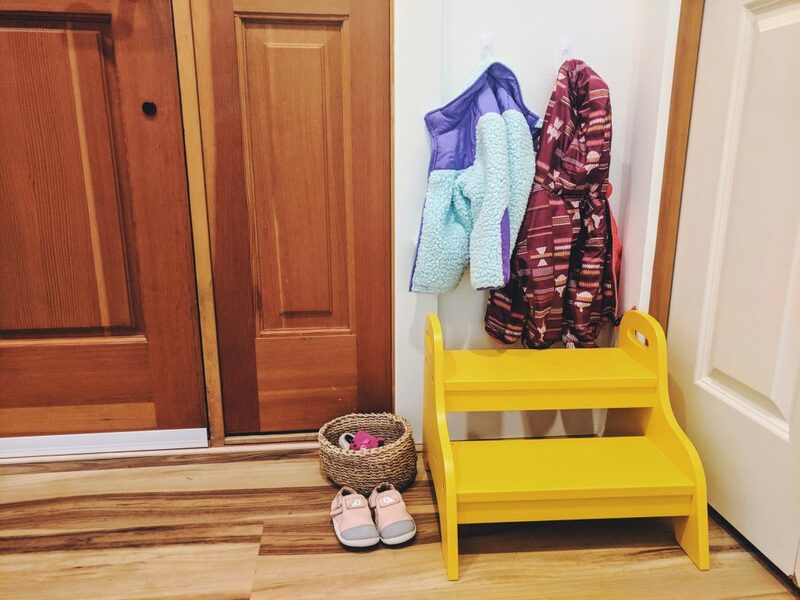 For example, by the front door, she has a small step stool and low hooks for taking on and off shoes and coats. Our coziest area is definitely our living room. We spend most of our day there, playing, reading, and working. I love the fireplace in the winter and our forest views outside. She loves being able to access all of her materials in one room, working beside me or independently. 5. To give an idea of a “usual” day in the life of your family, do you have any fun rituals or rhythms you’d like to share? One of our favorite rituals is our (almost) daily Dakota-led nature walks. We live near a forest, and I love seeing the sights and sounds that grab Dakota’s attention. 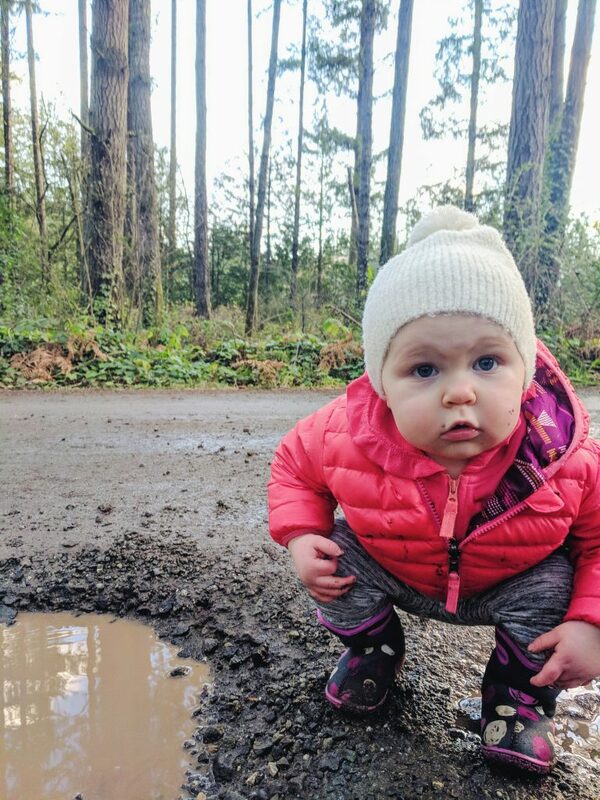 We don’t set out with an agenda or a place we need to get to, so she can stop at every puddle and pick up every rock she wants to along the way. Seeing her pure joy reminds me to appreciate all the little things. 6. What’s one way you bring peace and calm into your home? I really enjoy doing yoga, or simply stretching, at home, and have started inviting Dakota to join me. She calls it “stetch” and will start rolling around on the yoga mat with her legs in the air, or just sit beside me. I find it provides a few minutes of calm and mindfulness to our busy day, that we all need more than we realize! 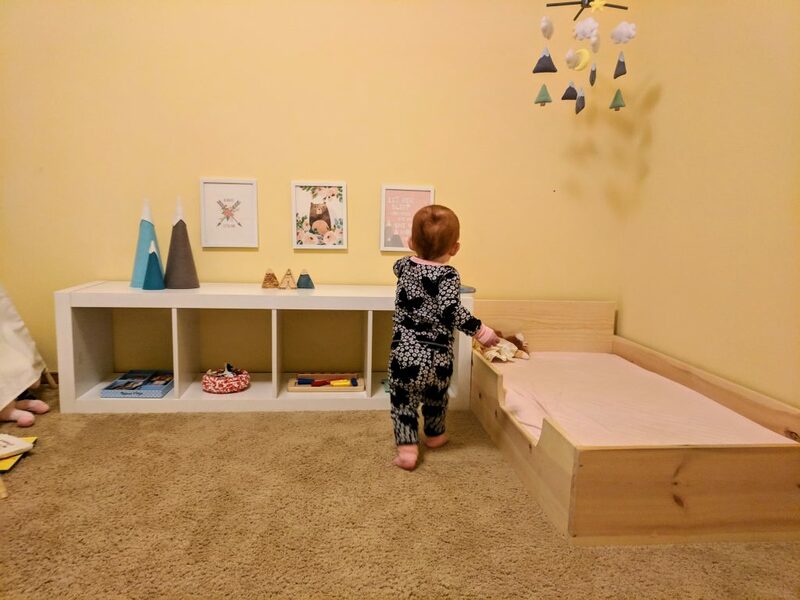 I have found it both easy and enjoyable to set up our Montessori environment at home. By observing Dakota at work, I’ve been pleasantly surprised by how apparent her interests and needs are. From creating and rotating materials to trying different furniture arrangements, I love it all. In contrast, as someone who moves and talks quickly, I sometimes find it difficult to give Dakota the time and patience she needs to complete a challenging task. I have to remind myself to slow down and to give her that time to focus and work through a new task. It’s always worth it!